First Course is the first level of the Gold Mushroom Pack in New Super Mario Bros. 2, as well as the tenth DLC level in the game. The level starts with a single Pipe Cannon. It then leads to a sky area mostly consisting of Flying ? Blocks containing Golden Mushrooms, vines, + Clocks, and a few Fuzzies. The Checkpoint Flag appears just after a Wiggler, followed by another Wiggler and some track-controlled lifts and Flying ? Blocks. After a few more Wigglers, Mario will encounter a few consecutive vines leading directly to the Goal Pole. Star Coin 1: On one platform, there is a Wiggler with two Flying ? Blocks, with the Star Coin between it. It can be obtained by bouncing off the Wiggler. 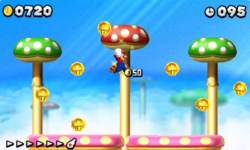 Star Coin 2: Some time after the Checkpoint Flag, one of the upper mushroom platforms has a track-guided Fuzzy, with the Star Coin above it. Star Coin 3: Before the Goal Pole, there are three vines that the player can swing on. The Star Coin is located after the third one. This page was last edited on November 27, 2018, at 02:03.